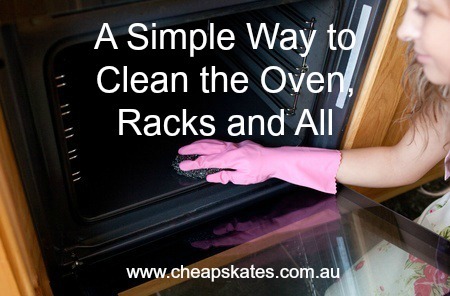 I clean my oven the same way Cheapskater Kirsty cleans hers, using dishwasher powder instead of nappy soaker (I don't use it!). It is the easiest, least scrubbing required method of cleaning the oven I've found and it works on even the dirtiest oven racks and filthiest oven. I use my Mr Clean microfibre clothes and they do a brilliant job too. "Everyone hates cleaning the oven, especially using those horrible chemicals on the very dirty racks. Before going to bed line the laundry sink with foil (Homebrand is great), add a scoop of Nappy San and hot water. Next add the racks from the oven and leave overnight. There is a reaction that occurs with the foil, soaker and the racks that cleans them without any hard work on our part. Just wipe with a cloth and dry and put them back in your clean oven. The oven can be cleaned with the water and a cloth. I use Enjo, but others would work just as well. The rangehood has these silver looking guards that collect all the grease and grime when cooking, if you take them out and put them in your dishwasher they will come out sparkling clean."